We made it to 100 followers which means we added more books (and 2 more winners) to our Giveaway Contest. Out of your choices, it's no surprise that Catching Fire by Susanne Collins was the run-a-way choice so it is now available too! 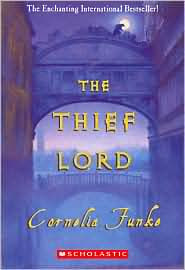 That's a strong YA title so we are choosing Cornelia Funke's fabulous The Thief Lord for a middle grade pick. And adding James Rollins' Map of Bones for the adult category. Huge hugs and much THANKS to all who have entered the contest - old and new followers alike! We have enjoyed everyone's comments and participation. And one of the best parts is checking out the new blogs we are finding through the folks new to our blog! Now we have 7 winners that will be picked from all you great people. And keep those entries and followers coming because remember, if we get to 125 followers we'll add 2 more winners and more books. Giveaway ALERT! If you've already entered the contest, a comment on this post (within 5 days of post date) gets you 2 extra entries in our MegaBook Giveaway. If you haven't entered yet, go to the contest post (or click on the contest link on the upper right sidebar) to learn about the giveaway and enter! You MUST be a follower and comment on the Giveaway Post to be entered in the contest. Good luck! Jennifer - yes, Catching Fire is the bomb! Sweeeeet! :) Are any of the books hardcovers? YAY! It's so cool you guys made it to 100 followers! I'm more excited by The Thief Lord since I've already read Catching Fire (it was awesome!!). Brittany - thanks and good luck! TJ - with luck you'll have a chance to get this copy! Krista - thanks, we're excited too! titania - The Thief Lord is excellent! One of our family favs! Yay for both Catching Fire and The Thief Lord! And very big congratulations to you for getting 100 followers. I think there's a very good chance that you can make it to 125 (or even 150, who knows?) before this contest ends. So everyone who isn't a follower yet, start following this blog at once so we can have more winners and MORE PRIZES! (yes, I'm greedy like that). Good choice on Catching Fire - that is one of the top books in my tbr pile! I've heard nothing but great things about the Hunger games and Catching Fire! I'm so glad the latter was added to the pot! OH I WANT TO READ CATCHING FIRE! Wonderful choices. I've got to read The Thief Lord. My daughter read it and really liked it. Exciting! I've been meaning to read The Thief Lord! I think I am one of the only people out there who hasn't gotten my hands on Catching Fire yet! Please enter my 2 extra entries so I might have the chance to devour it! Congrats! Just one more and you'll be 125! You added Catching Fire, such a good book! Congrats on all the followers! I've heard good things about the books you've added to the contest, but then again, pretty much all the books you have in the contest seems great! Waaa! Catching Fire. You are awesome! yay! You added Catching Fire! Sounds interesting! I love a good thriller.